If you're troubled regarding sacrificing the authentic style of traditional Virginia flue cured tobacco once switching to an electronic cigarette, you'll be able to put your fears to rest! merely order a bottle of our Virginia Flue Cured Tobacco e-Liquid and luxuriate in one of the most flavorful tobacco vapes you'll ever have. 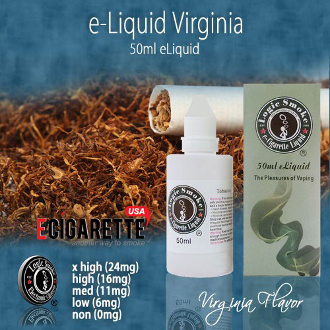 Trust us, there are alternative forms of Virginia flue cured e Liquid out there, however none of them compared to the pure, classic style of our Virginia e-liquid. With the perfect blend of an 80/20 PG/VG mix (propylene glycol and vegetable glycerin (organic, food grade preservative compounds), you'll get the best flavor concentration along with the perfect amount of vapor to satisfy your vaping needs. The 50ml bottle is a convenient and economical size for purchasing in quantity. Fill your clearomizer or other e-liquid atomizing device directly from the bottle or use it to refill your smaller travel-size e-liquid bottles. You'll be ready and have liquid on-the-go at any time.